I couldn't pass this link without sharing it with my readership. Its certainly not definitive, but fun nonetheless. If you like wallpapers and trees, but haven't been able to reconcile the two, try nature wallpapers. ScienceNews.org reported on Thursday that Israeli botanists helped Bar-Ilan University germinate a 2,000 year old date palm seed. The seed was part of an archeological collection, discovered when excavations in the ’60s uncovered five date pits in the Dead Sea region of Israel at Masada. The age of the seed was theorized through calibrated radiocarbon dating. The erroneous reporting came through the term "tree" and "sapling," when ScienceNews incorrectly classified the ancient plant as a tree. Palms are not trees. They are monocots, being more closely related to a grass. Totally different. Trees came down across several roads in the spotty Wednesday night storms across Atlanta metro. Although lightning was the cause of several power outages and an apartment fire, WXIA reported two arboreral incidents: a tree along Beckwith Street near the Atlanta University Center fell and landed on a car, and a huge tree limb near Glenwood Avenue came down and blocked the street. Neither tree was a pine, of course. How is that possible? - Greg's research relies on systematic cost-benefit models [Persuasive!]. - Planting tree varieties that require little irrigation will generate benefits many times the initial investment. - Tree planting efforts should not focus on the number of trees, as this can lead to putting trees in the wrong place. Maximally functional canopy is much more important. Blueberries are ready for picking. NOW. The weather has been sweetly perfect for berries this year, and Tree News just received a tip. The Thoms family farm in Griffin is ready to unleash blueberry mania. We found the big, plump, early berries that everyone craves. The prices are the same as last year: you pick a gallon for $10.00. The place is the same, also: 175 Chappell Mill Rd Griffin, GA. Betsy Thoms recommends that you call 770-461-6013 for updates on blueberry availability. This week they will be open for picking: June 9th Monday 6-8 pm; June 11 Wed. 9-11 am; June 12 Thursday 6-8 pm; June 14 Saturday 9-11 am. 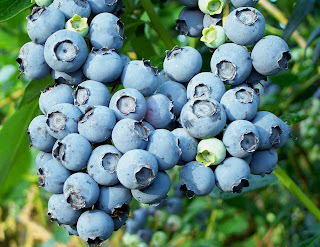 Pass this information on to your friends and family, web pages, and any where else that you think folks might like non-chemically altered, fresh blueberries. Remember these freeze well and easily. Don’t pre-wash the berries. Just put them on a cookie sheet in the freezer long enough to freeze the berries individually, then put them in freezer bags. You will be able to enjoy the berries all year.